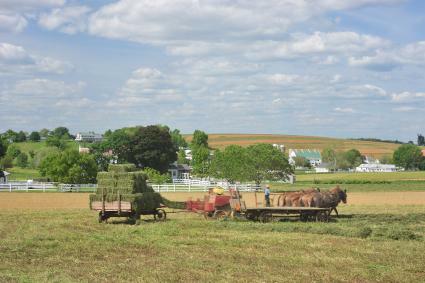 Throughout Lancaster County's lush rolling hills one can see the picaresque Amish farms that dot the landscape. The average Amish farm in Lancaster County, Pennsylvania has about 40 acres. The crops tend to include corn, tobacco, alfalfa, and various grains. The Amish have been known as some of the best farmers in the world. The discipline, hard work, and love of the soil which is essential to farming are also qualities that are synonymous to the Amish culture and traditions. It is believed that the typical Amish and Mennonite farmer produces a greater harvest while consuming less energy than his non-Amish neighbor. For over three centuries the Amish lifestyle has been centered upon agriculture. The origin of this dependency is partly due to the fact that the Amish as well as the Mennonites and Anabaptists - from whom the Amish religion derived from - were forced to flee during the 16th Century to the rural countryside to avoid persecution from the Roman Catholic Church and the Protestant reformers. Moreover, life on a farm coincides with their religious beliefs and traditions. To the Amish toiling with the soil, raising livestock, and growing their own food is seen as cooperating with God's will. Communing with nature is a form of communing with God. To the Amish, farming is not merely a job but a sacred lifestyle dictated by the Scriptures. Furthermore, the Amish are firm believers of hard work, responsibility, simple living, and cooperation among the communities. The rigors of farming has traditionally been seen as a way of ingraining these important values within the community. Because of the Amish prohibition again modern technology - and, the automobile in particular - an interesting problem arose as new agricultural technology developed. On the one hand, these new machines promised to increase productivity and save time and human energy. On the other hand, their usage threatened to become the start of a slippery slope which might ultimately lead to the Amish becoming just as dependent on modern technology as the mainstream world. In the early 1900's the Amish used similar farm machinery as their non-Amish counterparts. 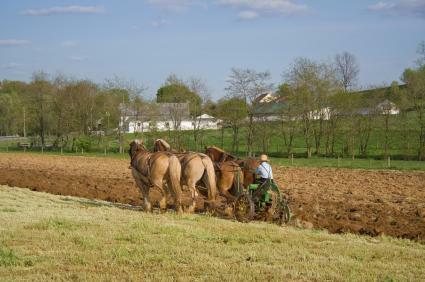 Farming was generally done with horse-drawn equipment to plow, cultivate, and harvest their crops. The Amish also did not have any objections to small internal combustible engines and used steam and gasoline engines to saw wood, grind feed, pump water, and power washing machines. During the late 1910's and early 1920's, primitive tractors were introduced to Lancaster County. These primitive machines had steel wheels and were often very clumsy to maneuver. Perhaps because they seemed like extensions of the steam engines, some Amish did use these early tractors to plow their fields. However, in 1923, the Amish communities revoked their decision to allow the tractors for commonplace tasks. Instead, the use of tractors was limited to high-powered needs such as threshing wheat. The reason for this reversal was largely because the tractor was considered too similar to the automobile. Both were self-propelled and could be driven about freely. The Amish leadership feared that acceptance of the tractor would lead to the acceptance of the car which was generally thought of as too modern. Also, during this time, the Lancaster County Amish community leaders had already allowed the use of other new technology such as hay loaders, tobacco planters, and manure spreaders. They began to fear that they were accepting the intrusions of progress too quickly so they decided to draw the line by only permitting the tractor in the barn and not in the fields. Finally, during this time period of the early 1920's, the early tractors were still very awkward to maneuver in the fields. Since horse-drawn equipment was still cheaper and easier to navigate, it seemed logical to many to stick with what seemed to work best. However, in the 1940's, new improved tractors were becoming increasingly commonplace in the non-Amish world. These newer lightweight models were smaller with rubber wheels. They were easier to maneuver and could be used for a wider range of tasks. Because of the advantages that these new lightweight tractors had over the horse-drawn equipment, many Amish began using them on their farms. However, once again, the Amish leadership, feared that similarity to the automobile would lead to eventual acceptance of the car. So, in the early 1940's use of tractors in the fields was once again forbidden. The close of the 1950's brought the introduction of new types of farm equipment that were powered by tractor engines and which increased productivity dramatically. The Lancaster County Amish faced a problem. The increased productivity would surely be welcome but they were reluctant to depend upon a tractor for power. The problem was solved when Amish mechanics devised what has become known as an "Amish tractor." The Amish tractor is a power unit which consists of a tractor engine placed on a full-wheel cart which in turn is pulled by horses along the fields. For several years the "Amish tractor" was utilized on Amish farms and used to power an assortment of equipment. However, once again Amish elders feared the new technology. They feared that the "Amish tractor" would lead to the dependence upon real tractors which in turn would lead to the acceptance of automobiles. So, once again, the Amish leaders made a decision. In 1966, the "Amish tractor" was banned from the fields. Today, tractors are used by Amish farmers but are limited to use in the barn. They are used to power feed grinders, hydraulic systems, ventilating fans; to blow silage to the top of silos; to pump liquid manure; and, a host of other similar functions. However, they are rarely used in the fields. Besides the reluctance to become dependent upon a machine that could lead to acceptance of the automobile, this restricted use of the tractor had practical purposes as well. Tractors, which are expensive, require more and more acreage to pay them off. Many believed that regular use of tractors in the fields would tempt more and more Amish families to increase the size of their farms. At a time in which the availability of farm land is steadily dwindling in proportion to the growing Amish population, it was imperative to limit the size of the individual Amish farms. Reliance on horse-drawn equipment would maintain the small family farm ideal and maintain community equality. Furthermore, the use of tractors in the fields would eliminate jobs. A strong ongoing fear in the Amish community is that men in search of work might seek employment in non-Amish run factories which might have a corrupting influence. Also, it should not be discounted that horse-run machinery on the farms has always been a powerful symbol of Amish identity which many did not want to lose. Another controversial innovation to the Amish farm arose with the introduction of the modern hay baler in the 1950's. At this time, there was a growing trend in the Amish agricultural community to shift from general farming to more specialized activities. Many Lancaster County farmers began specializing in dairy farming. As a direct consequence, the farmers had to double and triple the number of their herds. This increased the need for hay. The modern hay baler compressed the hay into compact bales that allowed large quantities to be stored in a small space. This innovation became a huge boom for the dairy farmers. The problem, though, is that the modern hale balers relied on a gasoline engine which is mounted on the baler. The Amish would then pull them by horse. Similar in concept to the "Amish tractor," the church leadership once again feared that such technology would lead to the introduction of the car. However, in this particular situation, the Amish leaders made an exception and permitted the hay baler. Many believe that the compromise was based upon the fact that dairy farming had become the chief source of income for many Amish farmers in Lancaster County. Forbidding the hay baler might jeopardize the livelihood of the community. Therefore, the hay baler became a technology that the community could not do without. Again, there was the requirement mandating that the hay balers be pulled exclusively by horses. Even today, horse continue to pull the hay balers on Amish farms. In the twentieth century and today, the Amish farmers have had to balance their long-held traditions and beliefs concerning modern technology with the cold realities of earning a living on a small farm. The solution has been to allow expansion within limits. Tractors are permitted to provide power in the barns but not in the fields. Powerful hale balers are permitted in the fields but are required to be pulled by horses. By keeping the horse in the field, the Amish community has been able to limit the size of the farms since self-propelled farm equipment is truly needed to operate a large-scale farm. Although the typical Amish farmer can't match the productivity of their non-Amish Lancaster counterparts who do rely on self-propelled equipment, the Amish farmers produce a greater harvest in relation to the amount of energy that is consumed. In today's world, there are two basic types of farm technology in Amish country. First, there is modern machinery and equipment produced by commercial manufactures. This equipment is designed to be pulled by horses. Second, there are machines, tools, and implements designed and manufactured by local Amish businesses. By manufacturing their own farm machinery, the Amish have created cottage industries which have created jobs for hundreds of members. This is increasingly important as the population grows and the availability of farmland dwindles. Back to an Introduction to the Amish people of Lancaster County.